My dad got me this bangle watch for my birthday. I absolutely love it and it’s a very stunning watch. I just think that the flowers get in the way of the time a little bit. No matter how many times you’ve seen pictures from the city, or films that take place there, nothing can prepare you for Venice in the springtime. It absolutely sparkles with sunshine and bubbles with excitement. And there’s no better place to sit back and take in the sights and sounds of the city than Piazza San Marco. St. Mark’s Square is truly one of the great European urban spaces, where you can still hear individual voices over the rush of traffic. And it also happens to be where I got the idea for the Fiori, a genuine Italian Murano glass bangle watch that would feel right at home in Venice. Inspired by the amazing 15th-century clocktower that rises over the square, we’re excited to offer the Fiori Bangle Watch. 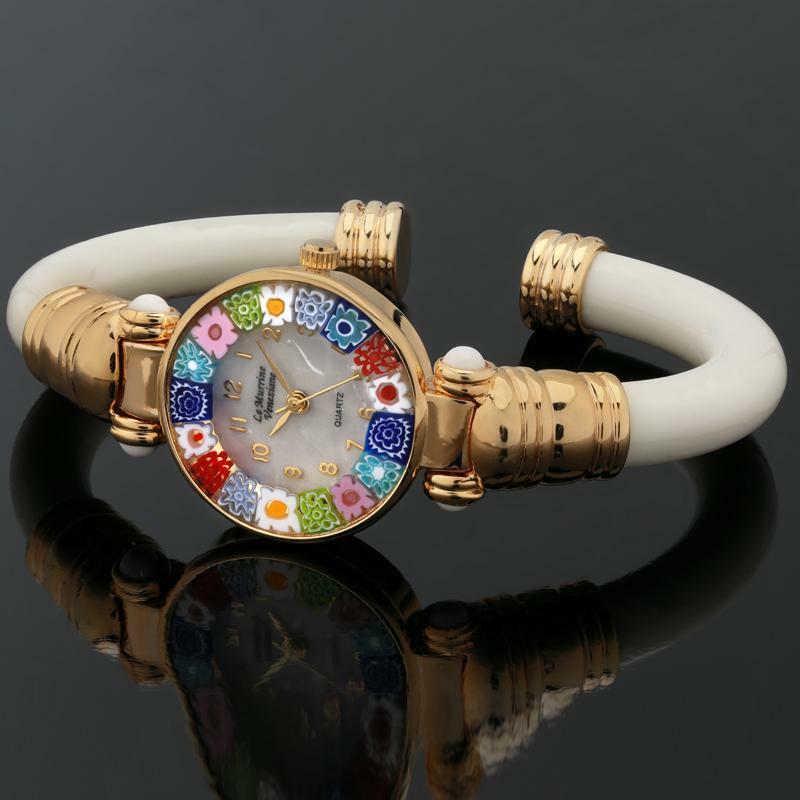 This horological beauty is adorned with incredible hand-made genuine Murano glass flowers that have been created in the age-old style called Millefiori (Italian for “one thousand flowers”). Using an extremely time-intensive process of heating, stretching, and cutting long delicate glass tubes, artisans crafted the beautiful blooms around the outside of the dial. It's an intricate process that takes the time and patience you can only find in the artisans of Italy. In your choice of onyx or ivory color. Fits wrists 6 ½" - 8"